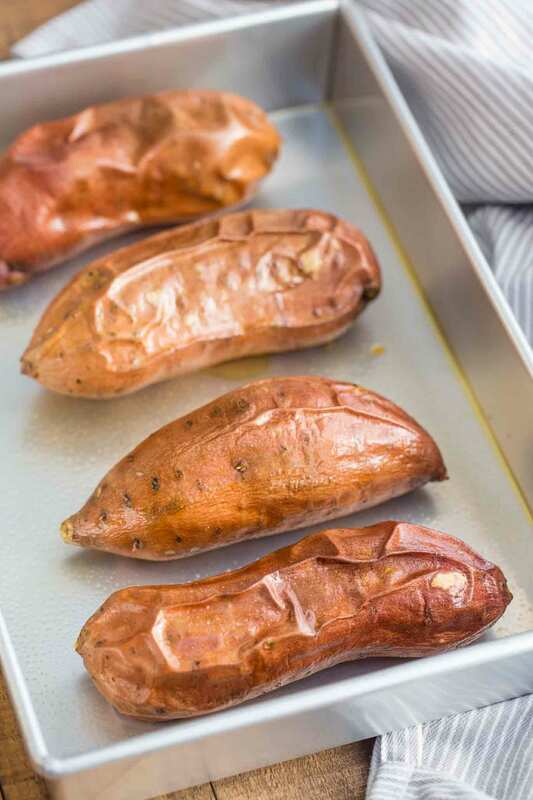 Easy Baked Sweet Potatoes recipe made with potatoes, butter, salt and pepper are the PERFECT addition to any dinner and ready in under 60 minutes! 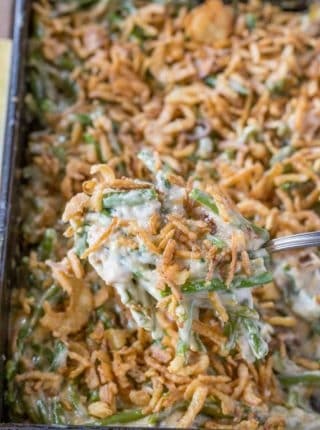 We’re always searching for easy side dish recipes around here, and some of our absolute favorites are Baked Mac and Cheese, Easy Mashed Potatoes and Roasted Green Beans. 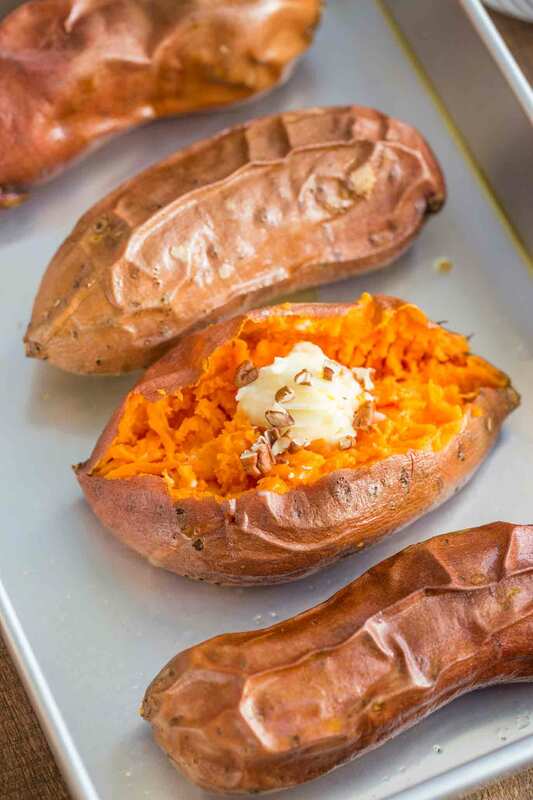 Easy Baked Sweet Potatoes are a healthier alternative to my Twice Baked Sweet Potatoes recipe, but still pack a TON of sweetness and flavor without all of the sugar. We like to serve these during the holidays because sweet potatoes are a really traditional flavor, but they’re actually perfect to serve all year long. 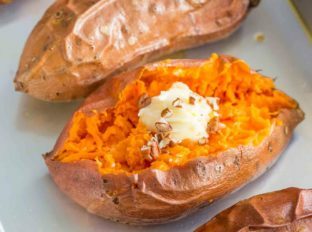 Usually baked potatoes are made with russets, but if you’re looking for a change sweet potatoes are naturally more nutritious and work just as well. Sweet potatoes also have a tough skin just like russets, so they are ideal for this kind of recipe. Most of the time I bake sweet potatoes on the middle rack of the oven. If you’re in a rush, you can pierce the outside of the potato skin and put the potato in the microwave, 5 minutes at a time until they’re cooked through, usually about 10 minutes for a large potato. You can also wrap the sweet potatoes in foil and grill them for 35-40 minutes, or until they’re soft. Another option is to bake the sweet potatoes in the slow cooker, if you need the oven for other things. Just clean and salt the sweet potatoes, pierce the skin, and wrap in foil before placing in the pot. Then cook on low for 9-10 hours or on high for a total time of 4-5 hours, until the sweet potatoes are soft. HOW DO YOU KNOW WHEN A POTATO IS BAKED? Sweet potatoes are done baking when a fork can go through to the center of the sweet potato easily and with little resistance. If you can’t get the fork through that means it is undercooked, let it go for longer. DO YOU HAVE TO WRAP POTATOES IN FOIL TO BAKE THEM? There are benefits to wrapping sweet potatoes in foil before baking them, but you don’t have to. The foil helps them stay warm once they come out of the oven, and helps keep the skin softer by trapping moisture in to steam them. If you want the skin roasted and crispy, avoid using foil in the oven and wrap them afterwards to keep them warm. When I make sweet potatoes in the oven, we eat them right away so I don’t worry about using foil. If you grill the sweet potatoes, foil keeps the flame from burning the outside. 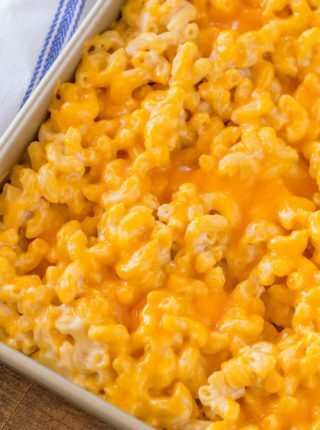 The foil can also increase the cooking time slightly. CAN YOU Meal PREP BAKED POTATOES AHEAD OF TIME? You can prep a baked potatoes side dish ahead of time by washing them the night before, but wait to cook until the day you’re serving them. Don’t wash them more than a day or two in advance to keep the potatoes fresh. 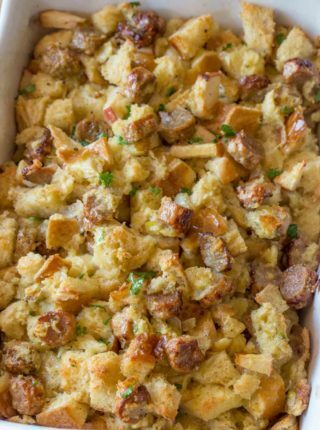 I recommend prepping the toppings the night before and refrigerating them, then setting the slow cooker in the morning so the potatoes will be ready just as you’re setting the dinner table. Baked sweet potatoes can be stored refrigerated in an airtight container for up to 4-5 days. Make sure your potatoes are all about the same size, or they’ll finish baking at different times and you’ll end up with over or undercooked potatoes. Rubbing wet potatoes with coarse salt helps make the skins crispy while also adding flavor when baking. Add a drizzle of olive oil when you’re salting your baked sweet potatoes to make the skin extra crispy. Add the butter while the potatoes are still warm, so it has a chance to melt. While the butter is melting, sprinkle with salt and pepper, and an optional dash of cinnamon for extra flavor. I like to line my baking sheet with tinfoil because sweet potatoes leak some juice when baking. Don’t add these directly to your oven rack or you will have to clean up sticky potato juice on the bottom of your oven. Preheat oven to 400 degrees, or you may need to add more cook time. Preheat oven to 400 degrees and wash the sweet potatoes before piercing the sweet potatoes with a fork all over. Place on baking sheet lined with foil and cook for 45-50 minutes until tender and serve sliced open with butter, salt and pepper. I need these sweet potatoes in my life. They look so amazing!!! Oh yes, self control around them might be a challenge! Enjoy!! Mmmm, sweet potato perfection! Such a nice change from regular potatoes and I love those crispy peels! Such a fantastic idea! Perfect for the holidays! These are perfect. 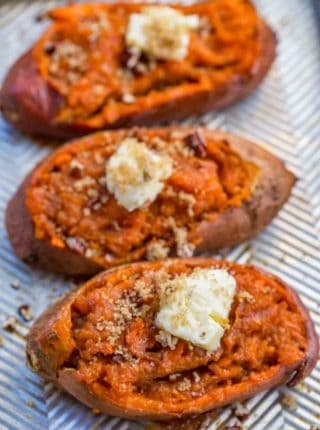 I love sweet potatoes and I love making these as a replacement for the traditional regular potato! So GOOD! I hope you enjoy them, Alli!